You probably read about Windows Live Messenger 9 (Wave 3) on here before but let’s take an even closer look. 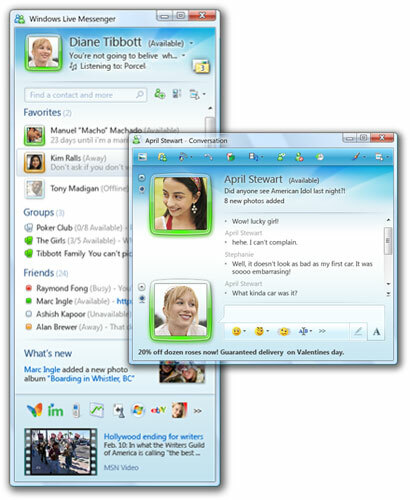 What are the changes compared to windows Live Messenger 8.5? What we notice first in the above is that the buttons for Shared Folders, Live Space, MSN Today and Mobile have disappeared. The only thing familiar that’s left in the top part is the Mail button, and that one has moved to the right. So where have they gone? See they did think about the sharing folders we already have on our computers too, can’t just get rid of what we already shared now can they! The new thing will be sharing your files online with Skydrive (not working yet, Page cannot be displayed). We are also missing the tabs (really? do you use them?). Apparently they moved to the bottom even though at the moment I only see Today (MSN Butterfly) there. If you look at the picture Chris posted before you see more of them. You also see this coming back in the DP rims (your contact’s and yours), they color along with status too. As you also notice the number of statuses has been reduced to 4, no more “Be right back”, “In a call” and “Out to lunch.” Online has been renamed to Available. In addition to the changing color for the rim in appear offline the DP will also fade. Hey, I see the brush appear there in the top corner! It’s hidden there till you hover over the header, so what is that for? We are used to it for changing our Messenger’s color scheme. Well we can still do that but there’s more! Scenes! Changing the scene will change the look of the main screen, but it won’t change the look of the conversation screen. Why won’t it? Because your contact’s choice of scene will determine what that looks like, a few examples are shown above. In addition to the themes available you can also drag and drop your own picture in the header, this will also be seen in your contact’s conversation screen. Just as with DP and Personal message this will be stored in the cloud if you have Messenger set to use the same display picture and personal message wherever you sign in ( Tools > Options > Sign In tab under General). In this screenshot you also see the What’s new feed. This will rotate the What’s new feed you see on Live Spaces, you will be led there if you click on the What’s New link, and also inform you when people change their DP or personal message. We also see Scott is playing a song…now that’s nothing new but what is new is that you can display both your Personal Message and Now Playing at the same time! Here you see the header in my main screen (where contact list is) with Personal Message and Now Playing and the convo header I saw when messaging Scott earlier. Neat, now you can have the ones you speak most to at the top at all times, no more searching through the contact list. Though I use the contact search bar for that. Groups, isn’t that how we sort our contacts? It was, yes, but now that is called Categories. Groups is new and is to create a multiple person chat that will stay till you delete the group. Each group can hold up to 20 members. I mentioned the contact search bar before, huge improvement there too: previously we had a search bar for Contacts and one to search the web, now these are integrated into one! Yay! Saves room! Now that’s way cool! We can now choose whether we want to show a DP in the contact list or just the colored block…and for both Favorites and Other! Can even vary with the size of the DP. Labeling can be done by “Display name” or “First and last name” and organizing by ”Categories” or Online status. We also see the return of what we saw so briefly some when in a previous beta: sort within categories by status! They also speak of SMS contacts, shouldn’t that be Mobile? They are grouped as Mobile anyway. Hold on! What about a setting a special sound for your contact instead of listening to the ones they’ve set? You can do so for sign-in sound and message sound if you right click on said contact in the contact list and choose “Choose sounds for this contact”. Here you will again have the choice of either setting one of the sounds already available or adding one of your own choice. You can set a different one for each if you want! Scott asked a good question there and unfortunately I didn’t find how to save a shared picture either, am I overlooking or… If not there that would definitely be something to ask for before it goes final! Note: If you try to send a screenshot with paste it will add it to Photo Share or start Photo Share instead of sending it. You can now hide the toolbar at the top, look at the arrows I’ve put a white square around. Should you ever want to hide display pictures or hid them by accident and want to show them again, there’s an arrow to do that on the left side of the conversation window too, just hover towards there and it will appear. – Links (including mail button) now open in the default browser. – Links in the contact list and conversation headers are clickable. – You can now have an animated display picture, it will take GIF files. Thanks BV2312, I completely forgot about that one already. – You can create your own display picture from webcam snapshots. This requires a webcam. As you can see you assign an emoticon to the picture so changing it is as easy as putting in one of those emoticons in your conversation. New Windows Live Betas – Download Wave 3 Now!